100% recycled Material; Fully biodegradable in home composting; Made in the USA; Huhtamaki is recognized for ongoing commitment to the enviroment by being Certified Compostable for all molded fiber products, a recipient of the EPA's Enviromental Acheive. Amazon.com has certified this product's packaging is Frustration-Free. A Frustration-Free Package is easy-to-open and comes without excess packaging materials such as hard plastic "clamshell" casings, plastic bindings, and wire ties. It is exactly the same as a traditionally packaged product--we've just streamlined the packaging to be opened without the use of a box cutter or knife and will protect your product just as well as traditional packaging during shipping. Products with Frustration-Free Packaging can frequently be shipped in their own boxes, without the need for an additional shipping box. 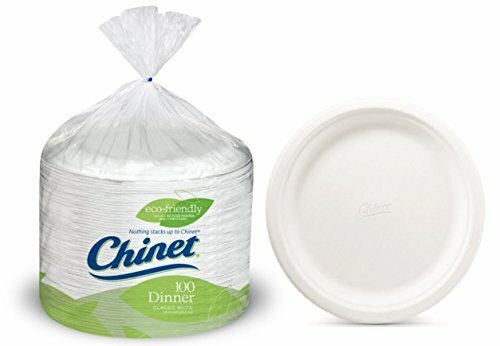 If you have any questions about this product by Chinet, contact us by completing and submitting the form below. If you are looking for a specif part number, please include it with your message.